Chip maker hopes to repeat the past with a graphics core that can upend Nvidia's dominance. AMD’s new Polaris graphics architecture ushers in a fourth-generation graphics core, unheard of power efficiency, and perhaps more importantly for the company, hope. The company said Monday that Polaris will pack a mostly redesigned GPU including the new fourth-gen GCN cores, a new memory controller, new multimedia cores, and a new geometry processor. Perhaps more importantly, it’ll be just as fast as a comparable Nvidia part, while using a lot less power, the company said. In a demo to the press, AMD showed off a PC with an early Polaris GPU running Star Wars Battlefield at 1920x1080 resolution at 60 fps and consuming just 86 watts. The exact same system outfitted with a GeForce GTX 950 consumed 140 watts. AMD used desktop parts to sub in for laptop parts as it didn’t have mobile components yet, but the chip will initially be aimed at laptops and more entry-level desktop graphics cards. Polaris chips will support both HDMI 2.0a and DisplayPort 1.3. The new chips are also capable of encoding and decoding H.265 video up to 4K resolution. That’s it for details on the new GCN, other than high-level bullet points like “improved shader efficiency,” “memory compression,” “better instruction pre-fetch,” and such. We do know Polaris chips won’t leverage AMD’s involvement with High Bandwidth Memory, instead relying on the more common GDDR5, or a variant of it called GDDR5+. AMD officials said that decision was based on the power and cost issues associated with HBM for a mobile part today, but reiterated that they believe in HBM and will continue to use it and future iterations of it. AMD’s new Polaris architecture will feature a 4th-generation graphics core as well as a new memory controller, geometry processor, and multimedia cores. Polaris, at least the initial ones, will be aimed at laptops and low-power consumption tasks. AMD said it should enable performance-levels in thin-and-light laptops that have been unheard of before. Microsoft’s Surface Book, for example, features a GeForce GTX 940M variant that’s fast compared to integrated graphics but is no speed king in discrete. In theory, one should be able to squeeze a Polaris chip into something as thin as the Surface Book. Polaris should also play well in small factor PCs. Much of the power savings can be attributed to a new fabrication process. Both AMD and Nvidia have been stuck on 4-year-old 28nm process, but this year AMD will move to either Global Foundries’ 14nm or TSMC’s 16nm process. Both feature FinFETs, which allow for better control of power leakage while offering more performance. Intel has enjoyed a FinFET-like feature it calls Tri-Gate that was introduced with its third-gen Ivy Bridge CPUs in 2012. AMD’s adoption, though, is a big deal for the chip maker, which has been losing market share to Intel and Nvidia for some time. With a move to FinFET and a 14nm or 16nm process, AMD’s new Polaris GPUs will be markedly smaller. 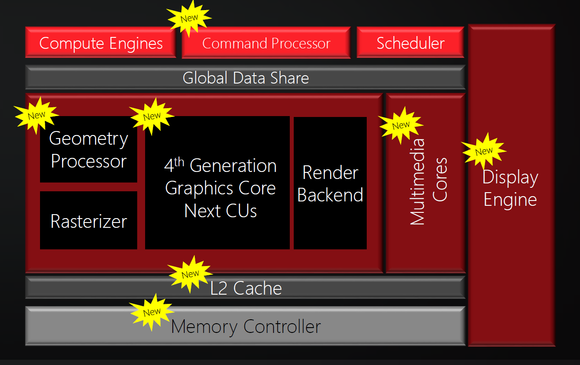 Polaris, in fact, may be an apt name for AMD’s new architecture. Polaris is also known as the North Star, which mariners relied upon to navigate treacherous seas. That’s not unlike the position AMD is in right now. The company recently regrouped all graphics under one czar who freely admits that AMD’s market share doesn’t look good. But Raja Koduri, who runs the new Radeon Technologies Group, said it’s not unlike the situation ATI faced in 2001. Nvidia had been on a tear with the GeForce, GeForce 3, and GeForce 4 series. ATI was an afterthought. That changed seemingly overnight when the Radeon 9700 came onto the scene. The card immediately put ATI back in the pole position. 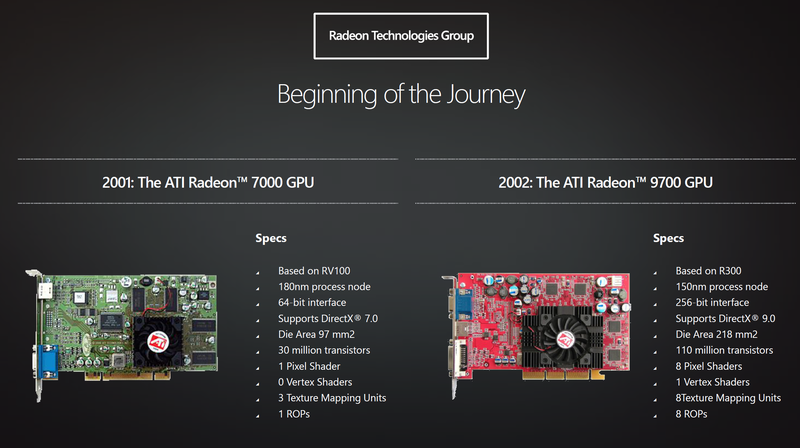 AMD believes Polaris will be this generation’s Radeon 9700, which saw the company overtake Nvidia. Will Polaris do the same? That’s difficult to say. For one, actual products based on the chip won’t ship until the middle of the year. The other problem is that AMD’s not alone in moving to a new, more efficient process. Nvidia is likely to see major performance and power gains from moving to a newer process, as well.